It’s not often we mark the anniversary of the publication dates of our books, but Movement Matters stands out for me. It feels like more than a book. It’s trite, I guess, to say it’s not just a book, it’s a way of life…but then, it kind of is a way of life, isn’t it? 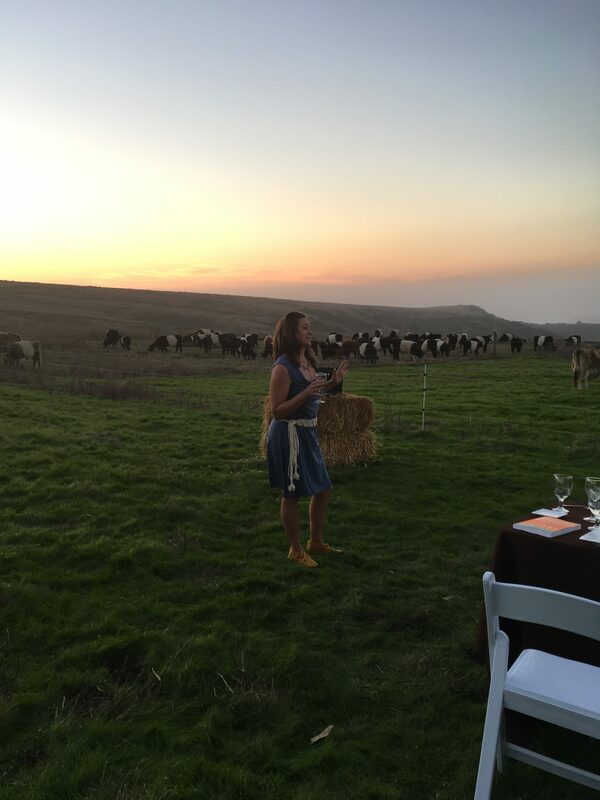 From the launch party last fall (entirely unlike any book launch party I’ve ever been to—and as a writer/editor/journalist/publishing person, I’ve been to lots) at which humans and cows hung out together on a beautiful, holistically managed ranch, pitching it to help prepare locally grown and foraged foods and sharing a meal around long tables in a field as the sun set over the Pacific Ocean, to the feedback we’ve heard from readers about the changes they’ve made to render their lives a little less convenient and a little more movement-rich, Movement Matters is the kind of book that easily invites you to take what’s between its covers out for a spin in the world. And that spin has a way of changing the world. Again, it feels like we are creeping dangerously close to the kind of breezy inspirational talk you might find on a motivational poster featuring a couple of unlikely animals cuddled up together, say, a fox and a duck. But really, in order for the world to change, all that has to change is one person. Or the way one person approaches one aspect of their life. Like using a hand-grinder to grind coffee beans. Or doing the back to school shopping at a second hand store. Or walking to the post office instead of driving. Game changers, all three. And absolutely achievable by just about anyone—if not those specific acts, then others just like them. So, yeah, here I am wishing a book Happy Birthday. If you haven’t had a chance to acquaint yourself with Movement Matters, there is no time like the present. It’s available in three formats—paperback, ebook, and audiobook. And Katy Bowman and I have had a number of chats about it on the Katy Says podcast series called Between the Lines, in which we discussed in detail all the books she’s written, so if you learn better by listening to a couple of nerds talk about books, you should check them out. You can get a look at the launch party here—it’s the next best thing to being there! And we’d love to hear what you think of the book—which, by the way, is a gold medal winner of Best Essays of the Year at the Foreword Indies, how could I have neglected to mention that till now! How have you changed the world in the last year? Drop us a line in the comments and let us know! My mother has always been a gardener. Together, she and my father turned our suburban corner lot into a glorious green place, where we grew most of the vegetables our family of six ate in the summer, where we composted our organic kitchen waste (long, long before composting was trendy, or even understood by our friends and neighbors), and where we kids spent summer evenings picking stones out of the soil, and summer mornings harvesting endless rows of beans, cucumbers, and tomatoes so my parents could pickle, can, and otherwise preserve them. Years passed, and our yard went through many phases, growing and changing as our family did. The huge garden gave way to a swimming pool and my parents continued to grow a few tomatoes and other favorites in raised beds my dad made. After he died, those went fallow, and then gave way to grass. But this year, my almost-seventy-year-old mother decided she’s ready to grow some tomatoes again. 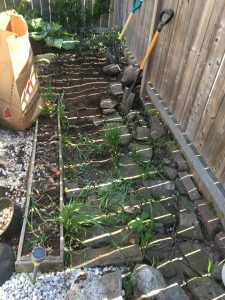 There’s a decently sunny patch just off the deck in the backyard, but it was terribly unkempt, filled with raspberry canes and spring onions that had gone rogue from other parts of the garden, and a rhizome-spreading visitor from next door. 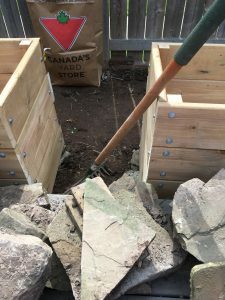 Mom wanted three planting boxes, and a stone pathway she could use to get among them to do her work. 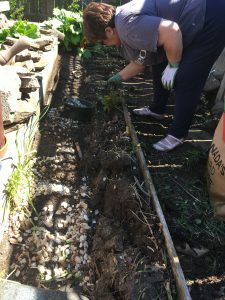 So, on a recent visit in advance of Mother’s Day, my spouse knocked together three nice planters, and Mom and I got busy with shovels, rakes, and brute strength. 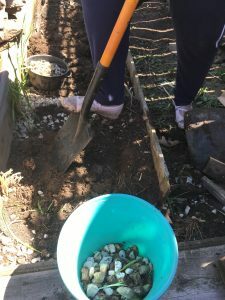 We pulled out an old planter, dug out bags and bags of that invader from next door, harvested some spring onions and some nearby rhubarb, dug out and moved rocks that were in our way, and got the area ready to become a new garden. 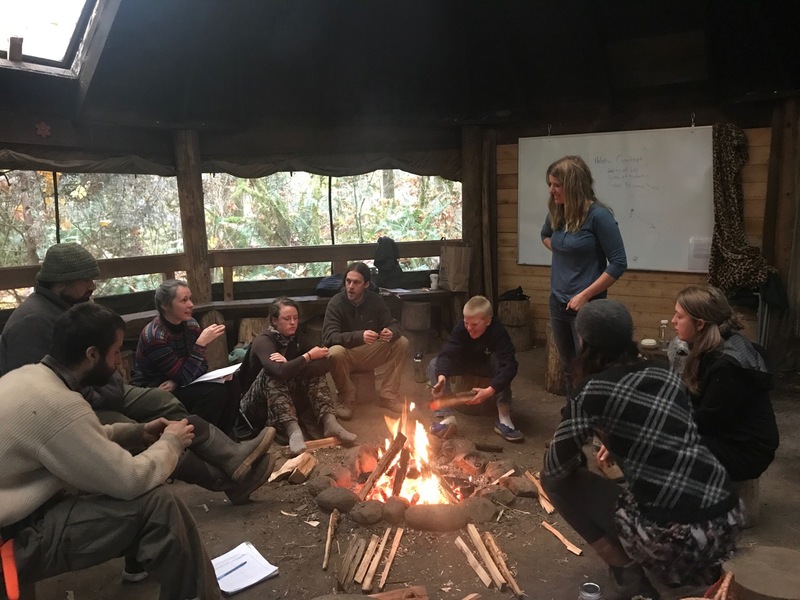 This made for two day’s worth of bending, pulling, pushing, grasping, squatting, single leg squatting, reaching, and twisting, lots of barefoot-on-dirt time, and tons of fresh air. Not to mention the time spent hanging out with each other, working side by side, or resting on the deck, drinking water and congratulating ourselves on our hard work. 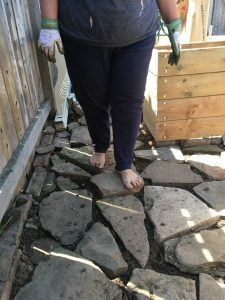 Mom wanted a path she could feel comfortable stepping down onto, and walking over, while she goes about her planting and weeding. Something that would provide both stability for her less-sure moments, and enough texture that she can continue to challenge her balance and give her bare feet some lumps and bumps to navigate. 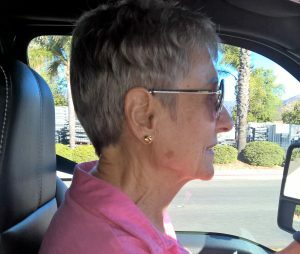 My mom has just started reading Dynamic Aging, and while she doesn’t see herself climbing trees like Joan, Joyce, Shelah, and Lora, she is absolutely interested in aging well, maintaining the mobility she does have, and even gaining more if she can. She’s even getting back to her composting roots, albeit on a smaller scale than our garden’s earliest days. I’ve been working to #stackmylife more consistently, and this project really lent itself to that philosophy: I moved more, and moved more of me, racked up some barefoot time, spent time with my mother, took care of a little patch of the Earth, enabled my mom to move more, and move more of her, and to divert some organic waste to her own backyard to feed the soil that will eventually feed her (and me, if I’m lucky!). Also, that’s Mother’s Day gift-giving done and dusted. A pretty efficient use of two mornings, I must say. 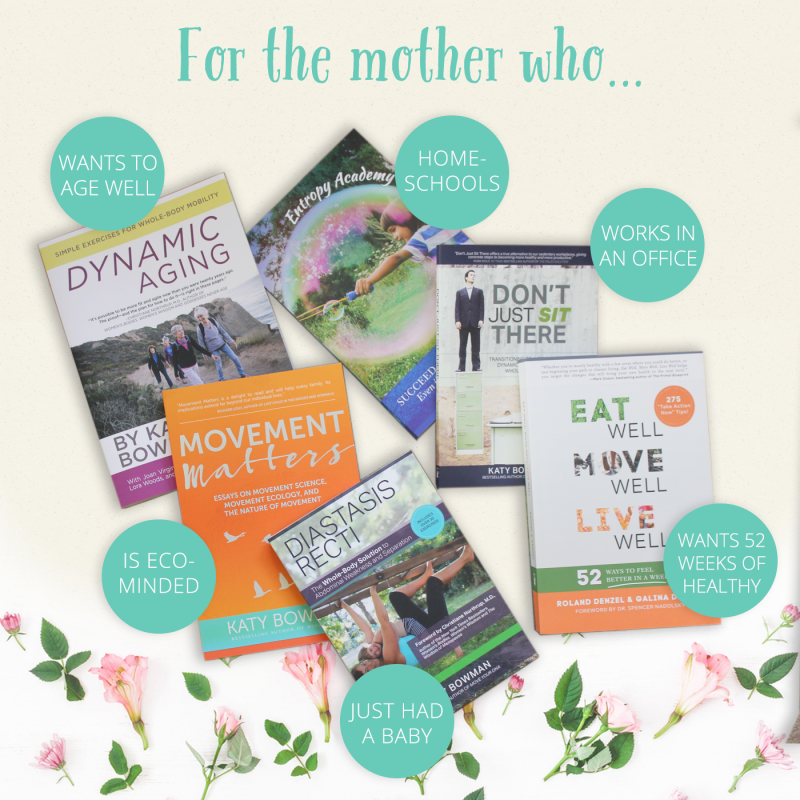 If you’re still looking for a gift for your mom, or for one you know, we’ve sorted some of our recent books into helpful piles for you! Find what you’re looking for at your favorite online or bricks and mortar book retailer, and Happy Mother’s Day to all who mark it! 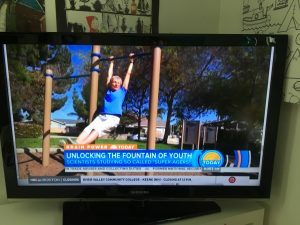 So, in case you missed it, one of our books was on The Today Show on Friday, no big deal (totally a very big deal). First of all, what a total thrill to see Katy Bowman and some of her Dynamic Aging co-authors on national television! And of course, the idea that millions more people were able to gain access to the ideas and possibilities presented in Dynamic Aging is the real fuel for our collective fire around these parts. The part of all this that remains the most awesome is hearing from readers. So, if you’ve had a chance to look at Dynamic Aging, we’d love to hear from you. Drop us a line in the comments if you like, and if the spirit moves you, maybe review the book on Amazon—reviews of all kinds help other readers decide whether a particular book is for them. 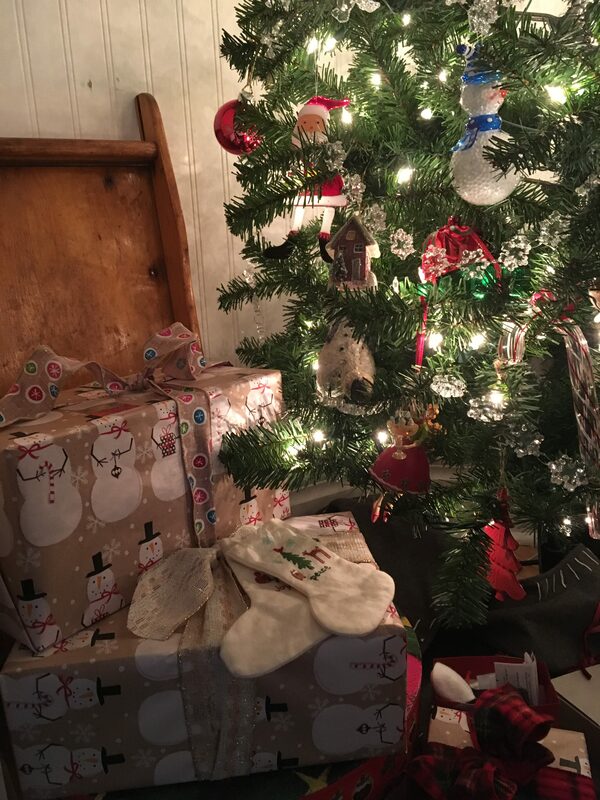 And now, it’s on to the next! (see under: laurels, not resting on). We are getting ready to release an expanded edition of Move Your DNA in just a few weeks. Tell you more about that soon! 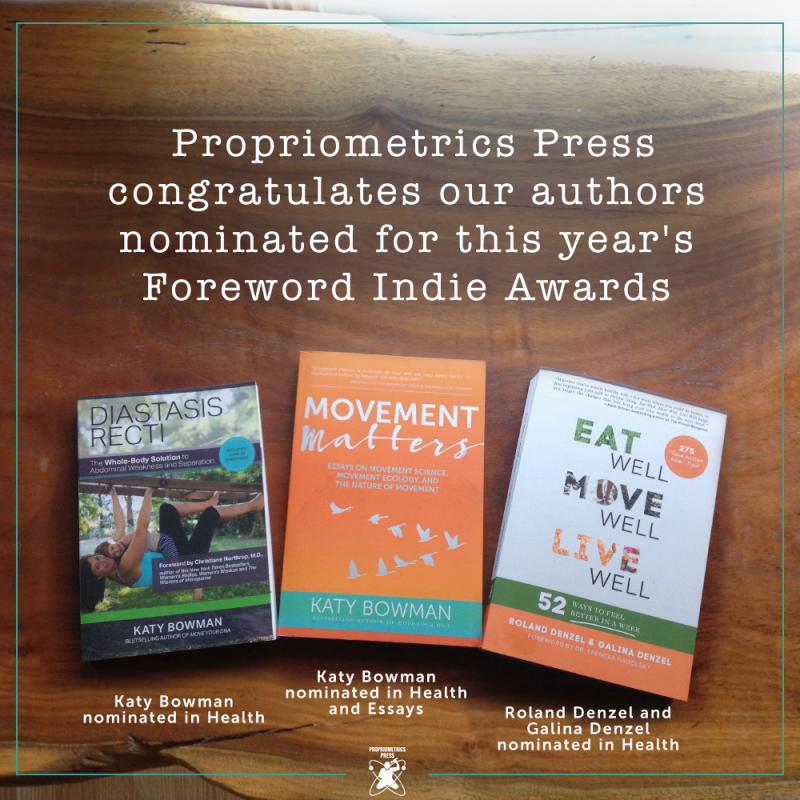 It’s been an incredibly exciting time around the Propriometrics Press offices! We’re delighted to share the news that Katy Bowman and three of her four septuagenarian co-authors will be on The Today Show on Friday, March 31, sharing what Dynamic Aging looks like in action. 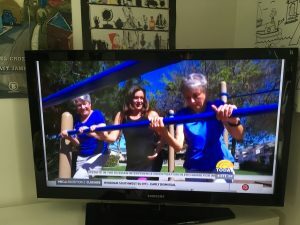 Katy and her co-authors spent a day with Maria Shriver in Ventura, California, right after Dynamic Aging launched, and you’ll be able to tune in and see the result of that on The Today Show during the 8 a.m. block. If you can’t make it to a television set, you’ll be able to stream the segment afterward, right here. We’ll share some video of the episode if we can to make it extra easy for you to find! 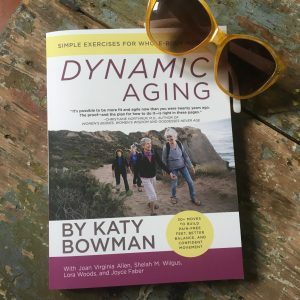 And if you’re looking to get your hands on a copy of Dynamic Aging, we’ve made that easy to find, too! Honors and mentions: Foreword Reviews Indie Awards! 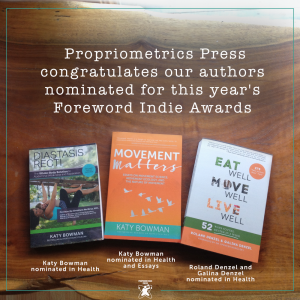 Foreword Reviews announced its 2016 Indie Award nominees yesterday and Propriometrics Press is thrilled to announce that three of our books are on the list! Roland and Galina Denzel’s Eat Well Move Well Live Well is nominated for best health book, Katy Bowman’s Diastasis Recti is also nominated for best health book, and Movement Matters, also by Bowman, is nominated in both the Health and Essays category. Winners will be announced during the 2017 American Library Association Annual Conference in Chicago on June 24, 2017. Good luck and congrats to our authors and the team that midwifed these books into the world! 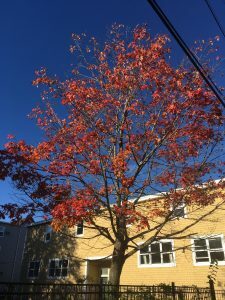 It’s October, and here on the eastern edge of the continent, that means changing leaves, frosty mornings, and earlier nights. The urge to cocoon is strong—but the season also offers amazing opportunities to be outside, a literal farmers’ market’s-worth of fresh, amazing produce, a deep desire to batch-cook soups and sauces, and, if we’re being honest, a to-do list as long as my arm. We’re readying new books for publication this fall, getting our spring list in order, and dreaming of future projects to share with you, too. 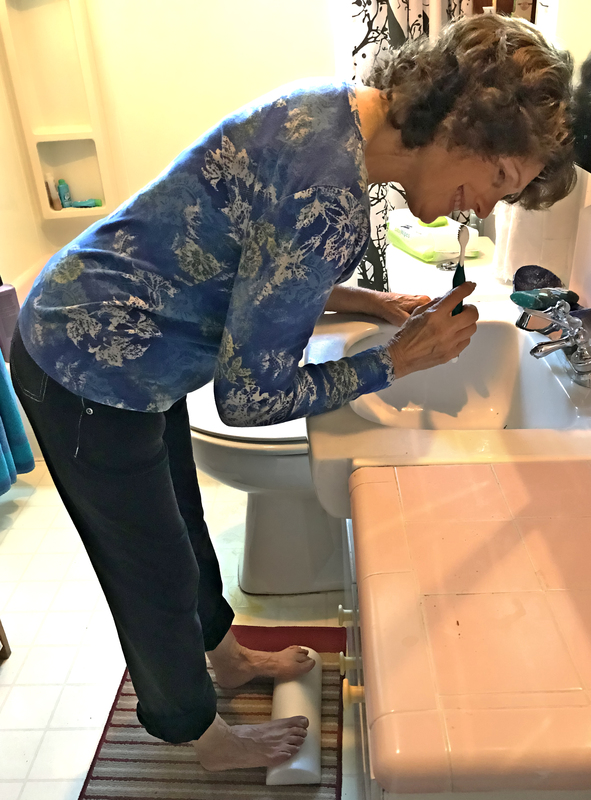 It can make for long days in the Propriometrics Press office—and it’s work that we love, so it’s easy to lose track of everything else while our noses are to the grindstone. Which is why I’ve been making a few minutes every day to really think about the wisdom contained in one of the books we’re bringing out this fall. 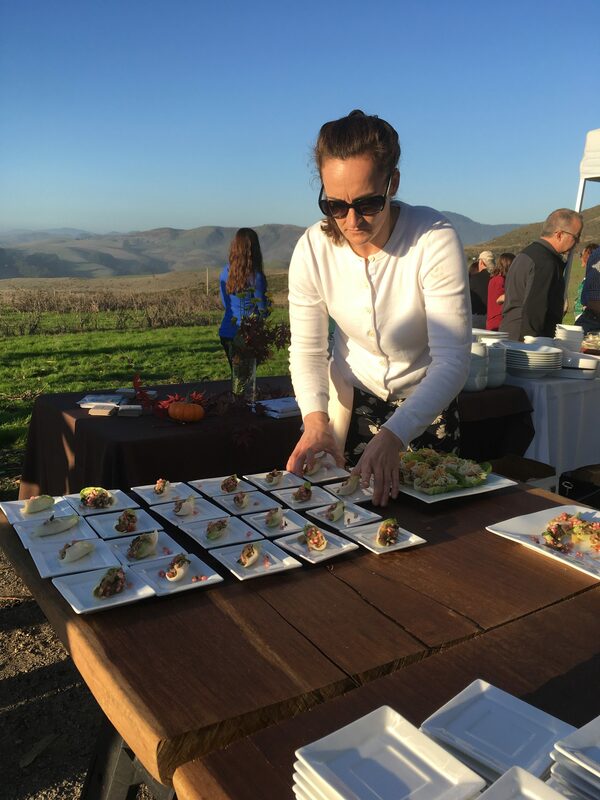 We published Eat Well, Move Well, Live Well on October 1, and authors Galina and Roland Denzel will hold a launch party for the book on October 15 in Orange County. We’re pretty excited about that. We worked hard on this book all year, and we’re pumped that it’s available now in stores and online. That part is all great. But one of the true perqs of this job is getting to dive deep into inspiring material every day. With Eat Well, Move Well, Live Well, it’s the four key chapters identified by the Denzels as the ones readers should start with: The Sunday Food Ritual, Tame Your Sugar Monster, Walk More Today, The Dynamic Office. It’s fitting this book is published in October, a perfect time to fully explore what these lessons have to offer. 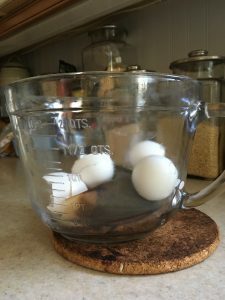 That Sunday Food Ritual chapter is about finding the time—making the time—to commit to setting yourself up for healthy food success all week by spending an afternoon or evening doing some batch cooking. 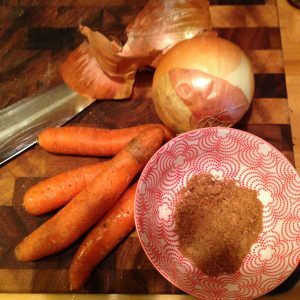 In the example the Denzels give, you make a simple slow cooker pork pot roast with vegetables, which gives you enough for Sunday night’s supper, and two more suppers later in the week. Just the words slow cooker pork pot roast make me want to hit the kitchen—and thinking about having three suppers done and dusted in one go fills me with glee. Chilly October nights seem like a perfect time to get into this habit. And I’m ever mindful that the holidays are approaching, with all their sugary delights, so October also seems like a good time to find a way to tame my sugar monster. 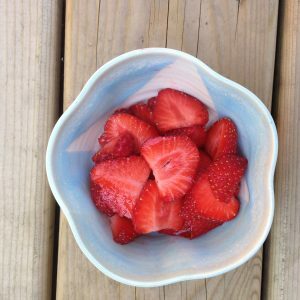 There’s an abundance of fresh fruit to be had—plums, peaches, apples, pears, there are even still strawberries in my farmers’ market most Saturdays, though I’m sure there can’t be many strawberry Saturdays left. I’ve been savoring that fresh fruit as it comes in, and doing my best to can and preserve as much as I am able for the long winter nights to come. 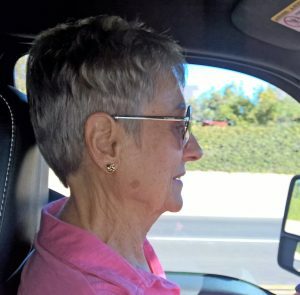 And with the cooler temperatures here, both day and night, Galina’s advice to sip a sweet-tasting herbal tea like licorice or rooibos feels like exactly the right thing to do while I contemplate my relationship with sugar, and why I want to be in charge, rather than letting sugar run the show. And then there is the glorious exhortation to Walk More Today. It is the constant entry on my to-do list. No matter how much I walk, I can always walk more. This morning I kept my regular weekly appointment with a couple other writers at the central branch of the public library, downtown. Then I walked part-way home with one of the writers, stopping in at our local bookstore on the way, and chatting about our work as we went. We split off in different directions and I loped along, drinking in the impossibly clear, impossibly blue October sky, the heartbreaking reds and yellows and oranges of autumn leaves, the feeling of the sunshine on my skin, the expressions on the faces of the people I passed as I walked, and the company of my own thoughts. 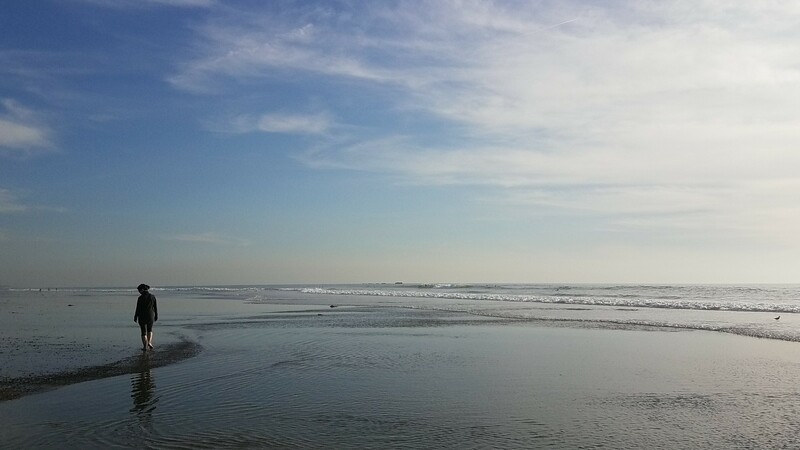 I concentrated on my gait as best I could, and then I just let my attention wander. I thought about the project I’m writing, and about the work awaiting me in the Propriometrics Press office. 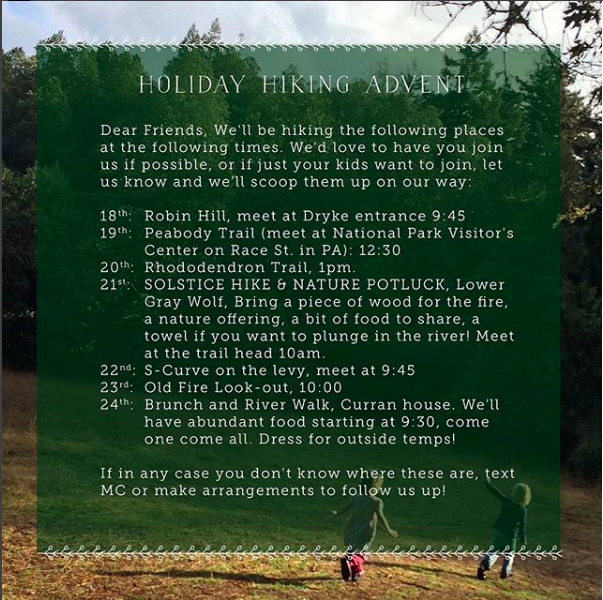 I returned to my desk feeling refreshed and nourished by my time outside, spent walking. Speaking of my desk! I loved Roland’s chapter on The Dynamic Office. When I had a full-time media job, I sat for years and years, until finally one day I rebelled against the sit-down culture and made my own stand-up desk. Then I stood for years and years. 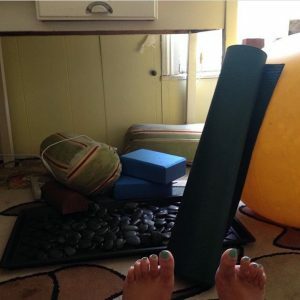 Then I quit that job, and came to work for Propriometrics and started doing my work sitting on the floor, or lying on the floor, or while walking to the store, or standing in the kitchen, or—well, you get the idea. I’d do my work wherever I could, in as many different positions as I could. But not everyone has that kind of flexibility (if you will). Maybe you have to sit at a desk, and if that’s the case, Roland offers ideas and advice to make your desk time more dynamic, and, importantly, to make your non-desk time more dynamic to counteract all that undynamic desk time! His advice to keep a log of your daily time spent sitting was also world-rocking. I thought I was pretty dynamic—but there are always more ways to move. And on that note, it’s time for me to get up, stretch a little, maybe get a cup of licorice tea, and walk to the store to get some supplies for supper for tonight and beyond. Sometimes the Sunday Ritual is really the Wednesday ritual. But as the book says, it doesn’t matter when you do it, so long as you get it done!